Senator Claire McCaskill and Robert Hirst at the Capitol Hill event. Photo courtesy of Curt Suplee and the NEH. 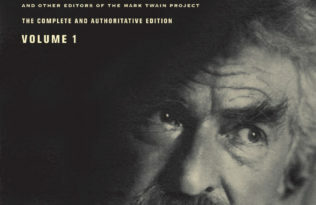 The General Editor of the Mark Twain Project, Robert Hirst, was invited to Washington, D.C. in February to speak about the process of editing and publishing Mark Twain’s papers. He spoke at the headquarters of the National Endowment for the Humanities (NEH), which gave its first grant to the Mark Twain Papers in 1967, and has helped support the publication of more than twenty volumes of Mark Twain’s letters, essays, and novels. The NEH also helped create the UC Press Foundation’s Humanities Endowment through a grant in 2004, which ultimately supported the publication of the Autobiography of Mark Twain. Hirst’s presentation, entitled “Editing a Humorist is No Laughing Matter,” described his efforts to decipher the various marks left on Twain’s manuscripts—from playful scribbles and stylistic quirks, to alterations by previous editors, to Mark Twain’s intentional cancellations.